The ultimate table flag instantly adds verve, when solid steel meets the luxury of silk. The result is an exquisite table flag that you just have to have on your desk. Our most popular table flag amongst corporates, it is simply a MUST-HAVE for your office desk/table or home. Our superior-grade stainless steel allows it to be absolutely maintenance-free from polish or rust. An ideal choice for gifting or personal use. 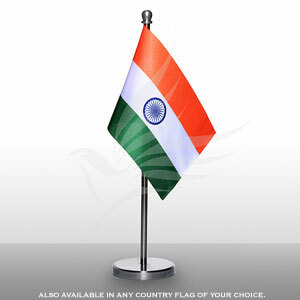 Firmly holds flag staff within it's threaded hole and can easily be removed/replaced/interchanged with another flag. 1mm self-adhesive underlaying foam to prevent scratches/damage on glass/wooden surfaces. All contents packed in our exclusive box packaging that includes basic flag etiquette and washing & care instructions.